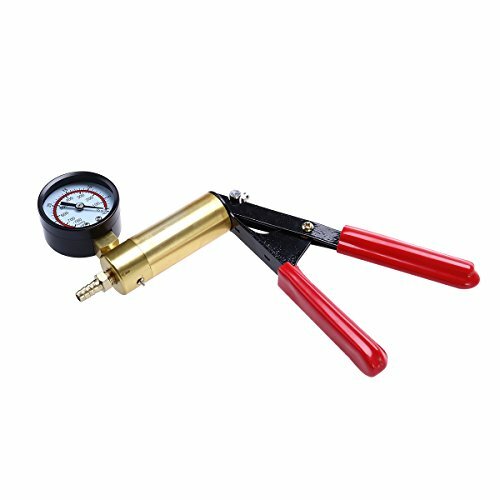 This item is 2 in 1 brake bleeder and vacuum pump tester tool kit. With this pump bleeder kit, you can bleed brakes and test automotive vacuum systems in the comfort of your own garage. This self bleed hand held vacuum pump works on all vehicle makes and models, including diesel engines. - Hand Held Vacuum Tester and Pump Brake Bleeder Kit. - Works on all Makes and Models of Cars. - Tests automotive vacuum systems. - Smooth Action Pull Trigger- DIY brake bleeder tool to minimize mess. - Suitable for home and business applications. - Designed for all vehicles. - Gauge scale: 0-30" HG, 0.76CM HG. - Hand pump with built in vacuum pump. - (2) 1/4" ID x 23" vacuum hose. - (2) 1/4" ID x 3" vacuum hose. - (2) Tapered hose adaptors. - Brake bleeder valve adaptors. Color: As the pictures shown. Material: Plastic. Hand Held Vacuum Tester and Pump Brake Bleeder Kit. Works on all Makes and Models of Cars. Smooth Action Pull Trigger- DIY brake bleeder tool to minimize mess.